^ "Russian Tortoise - Description, Habitat, Image, Diet, and Interesting Facts". Animals Network. Retrieved 5 November 2018. ^ "Russian Tortoise Diet". 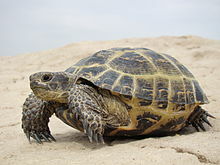 russiantortoise.org. Joe Heinen. 2002. Retrieved 7 January 2017.